For years I have been searching book shops for a copy of the first book that I ever owned. What happened the original, I can only surmise. It was a gift from my older sister, who must have been just a teenager herself when she gave it to me. 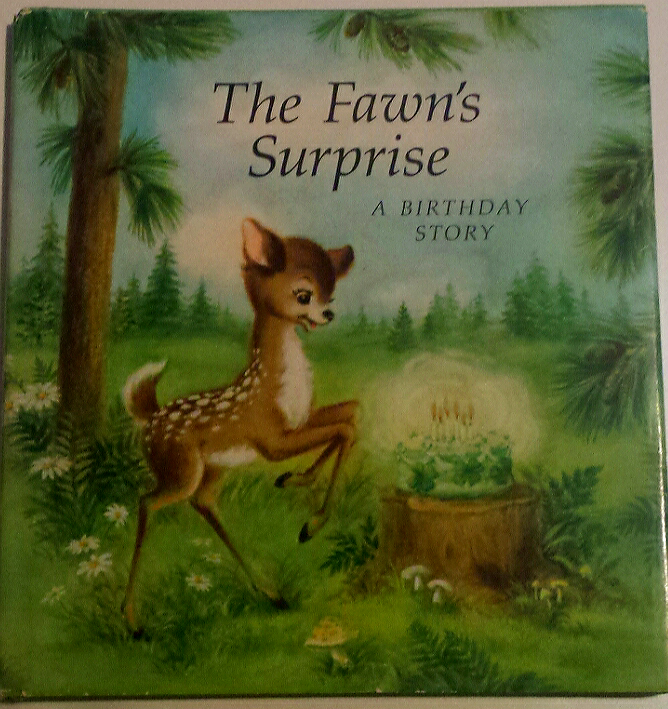 All I had to go on was that the cover was green and the story was about a little deer who was given a surprise birthday party in a forest. 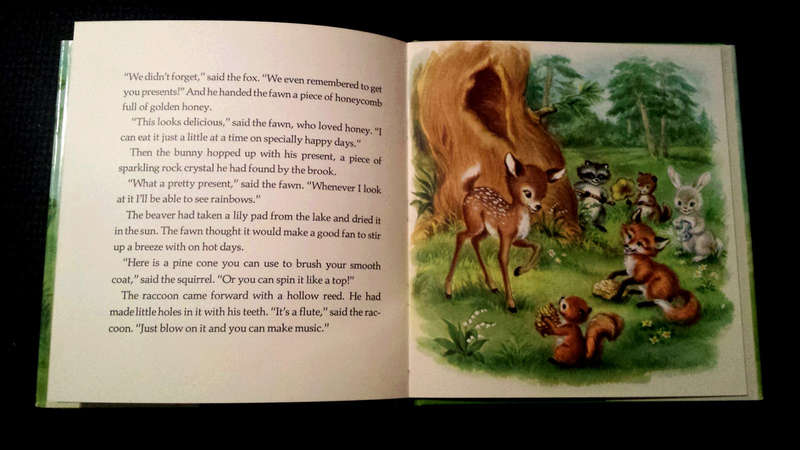 There were fireflies, a honey comb, a cake made of clover. 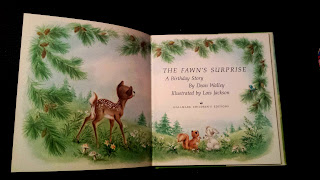 Google was no help at all, and for years I searched through online vintage book shops and Ebay stores, but to no avail. And then, a few weeks ago, I found it. There it was in a shop three thousand miles away, in America. It was all there; the green cover, the little fawn, the clover cake covered in fireflies. I was over-joyed and even more so when the book, much smaller than I remembered arrived in the post. 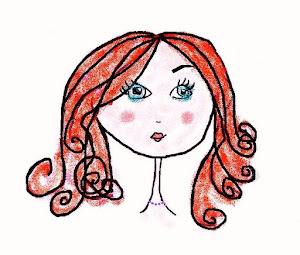 The images were just as I recalled, the story just as beautiful. Though I can't be sure, I must have been very young when I first owned it, because I couldn't read yet, which is probably why the pictures made such an impression on me. See how 1970s it looks? The key colours seem to be green, brown and yellow, the colours of my childhood. The illustrations are adorable and Lois Jackson perfectly create the magic of the enchanted forest, where animals talk and sing. Author Dean Walley writes in the genre best captured by Beatrix Potter, who delighted in investing animals with the gift of speech, and thoughts of their own. 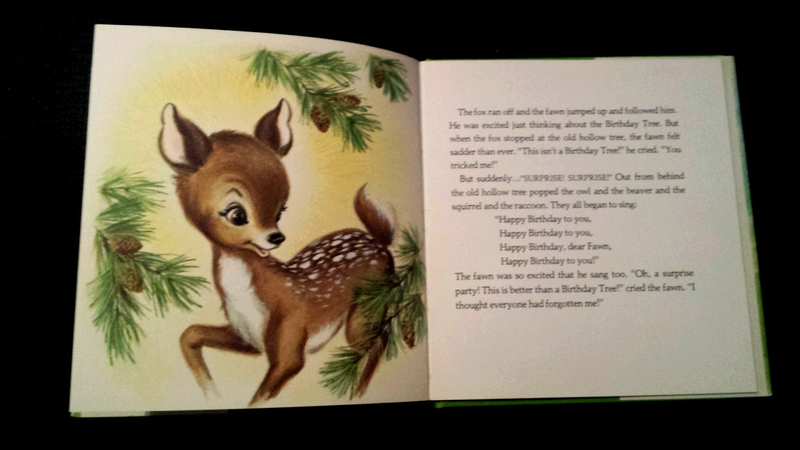 The premise is simple: the animals pretend they have forgotten the fawn's birthday, but surprise him at the end. 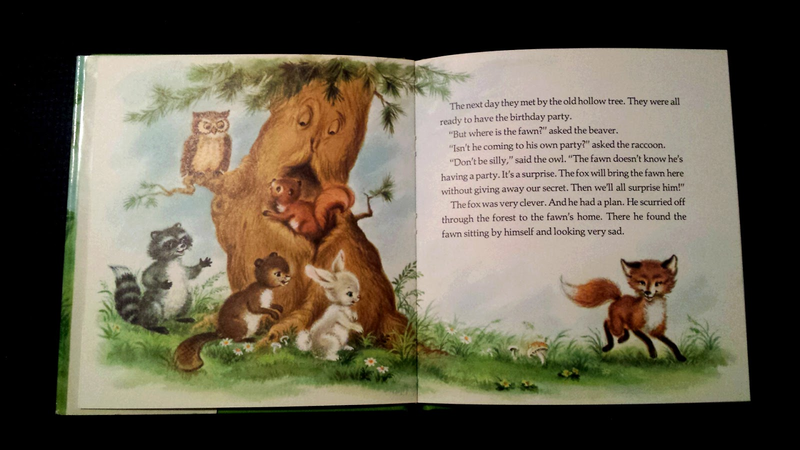 His joy is complete when they emerge from the old hollow tree with home made gifts. Wonderful! 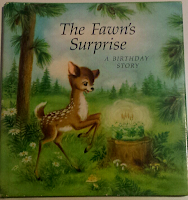 I wonder if it was this story that prompted my sister to give me a similar surprise for my 13th birthday, possibly. giving them a glimpse into the past, into that 1970s world of light brown and cold yellow. All that is missing is an electric fire in the bedroom, vinyl wallpaper on the walls and the sound of The Bay City Rollers on the radio. Well, maybe some things are better kept in the past, but this little treasure will be with me and mine now forever.